The defending Sun Belt Conference (SBC) champion men's basketball team was the overwhelming favorite in the preseason poll of SBC coaches. 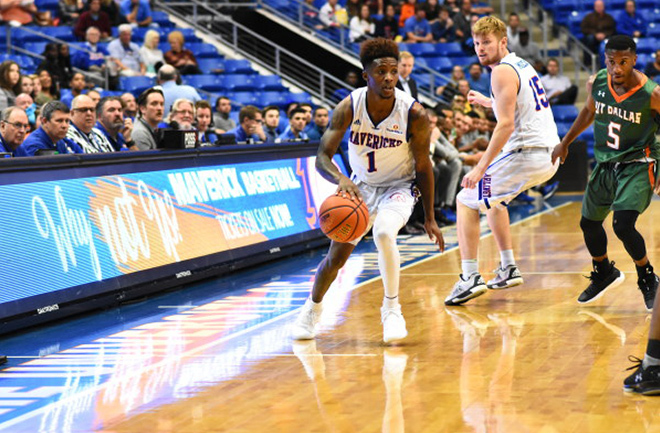 Sun Belt Conference Student-Athlete of the Year senior forward Kevin Hervey and senior Erick Neal, one of the nation's top point guards, earned spots on NBC Sports' 2017-18 Mid-Major Preseason All-America teams. The Lady Mavs basketball team picked up votes in the USA Today Sports Coaches' Poll, a first in program history in the preseason poll. Sun Belt Conference coaches picked the team as the preseason favorite for 2017-18. After winning the Sun Belt Conference Western Division Championship, Darin Thomas was named Sun Belt Coach of the Year. The Maverick softball team had 11 players named to the National Fastpitch Coaches Association's All-Academic team for the fourth consecutive year. Women's golf debuted with a team of six players, including standout freshman Ava Schwienteck, who led the team in all five fall events. Maverick volleyball wrapped up its fall season in November, the first with new coach J.T. Wenger. The UTA men's track and field team swept the SBC's cross country, indoor, and outdoor titles in 2016-17, the second time since 2014 the team claimed the "triple crown." The men's cross country team finished as runner-up at the fall Sun Belt Conference championships while the women's squad placed eighth. Coach John Sauerhage snagged a trio of conference Coach of the Year awards to give him a total of 31 during his tenure at UTA.